I have exciting news! 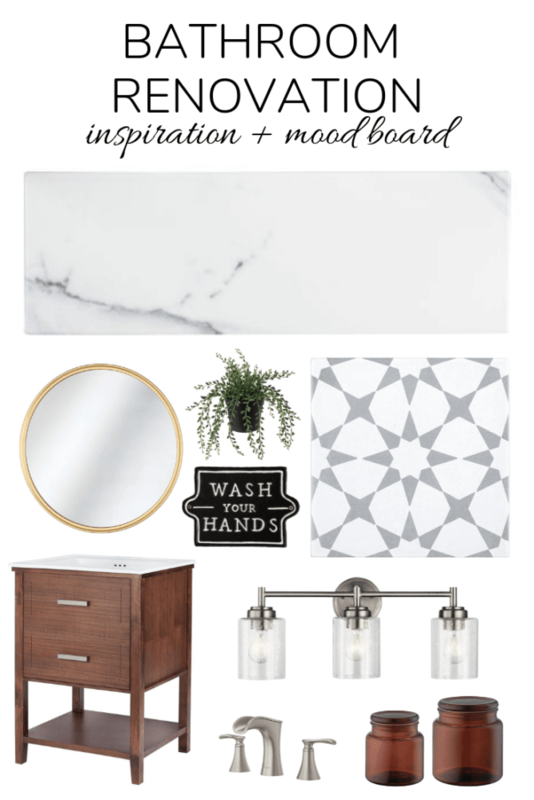 We’re embarking on a major bathroom renovation in our kids’ bathroom, and I’m sharing all of the details today. Welcome to our kids’ bathroom (also known as our guest bathroom and the only bathroom in our home aside from the master). 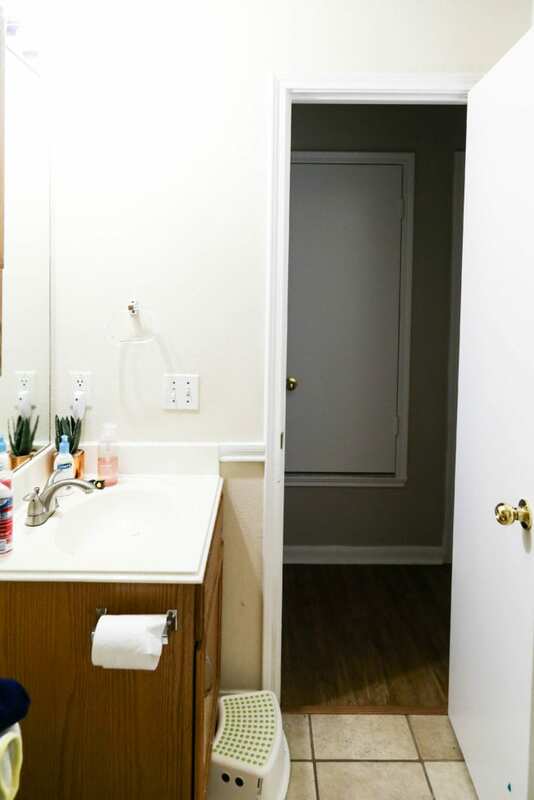 You may not be able to tell from the above photo, but this bathroom is disgusting. We knew it was in rough shape before we even bought the house. The inspector noted that several of the tiles were completely missing grout. And, when we moved, in my sister spent a good hour trying to scrub the room down only to realize that it was impossible to actually get it clean. The grime is just a part of the bathroom now. 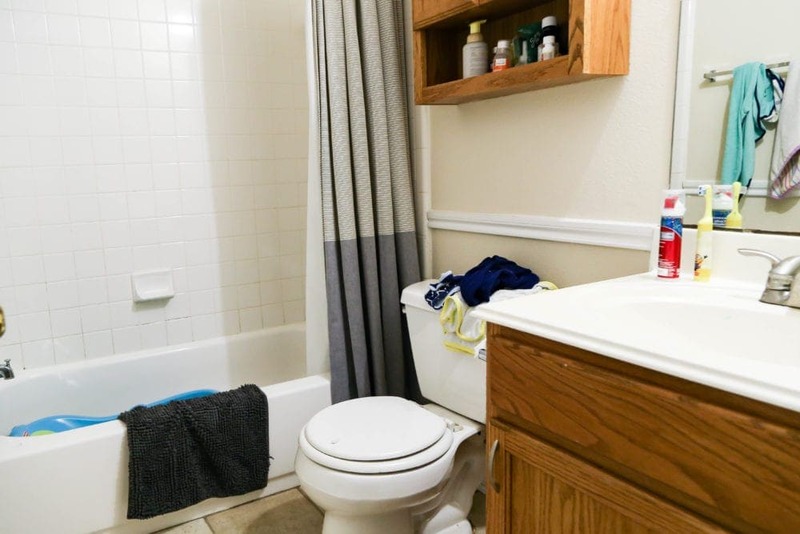 We’ve lived with this gross mess of a bathroom for far too long, and it’s time to do something about it. But first, what good is a big reveal without the nasty befores? If you’re having your morning coffee, you may wanna set it down before you keep reading. This isn’t pretty. I swear to you that we aren’t just disgusting people. The stains and nastiness were there before we moved in (although, the toothpaste on the wall is courtesy of my five-year-old). I’m pretty sure that grout used to be white, and there’s just this aura of filth that permeates the room when you’re there in person. I think I’ve probably convinced you at this point that the renovation is way overdue. Let’s chat about how we’re getting it done. You might remember that last spring we participated in the Jeffrey Court Renovation Challenge to make over our dining room (if you haven’t read those posts, make time to do it today! The transformation is jaw-dropping!). Well, it rolled around again and we were invited to participate and we said YES! Now, some of you are shaking your heads at me right now. I see you. 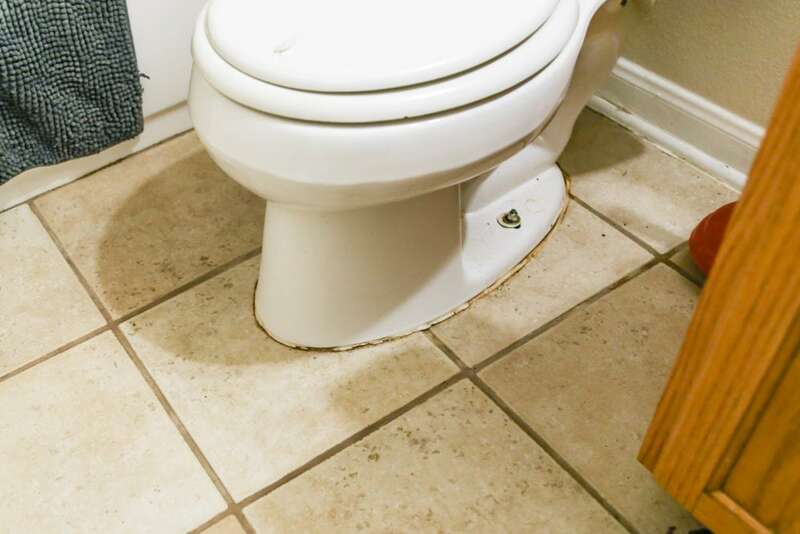 You remember the last time I tried to renovate a bathroom in just six weeks and I swore up and down I would never do it again for a myriad of reasons, one of which being I was never really satisfied with the job we did on that bathroom because it was so rushed. Just kidding. In all honesty, this is a very different situation. When we did that bathroom Corey and I were both working full-time outside of the home and it was about four times the size of this one. 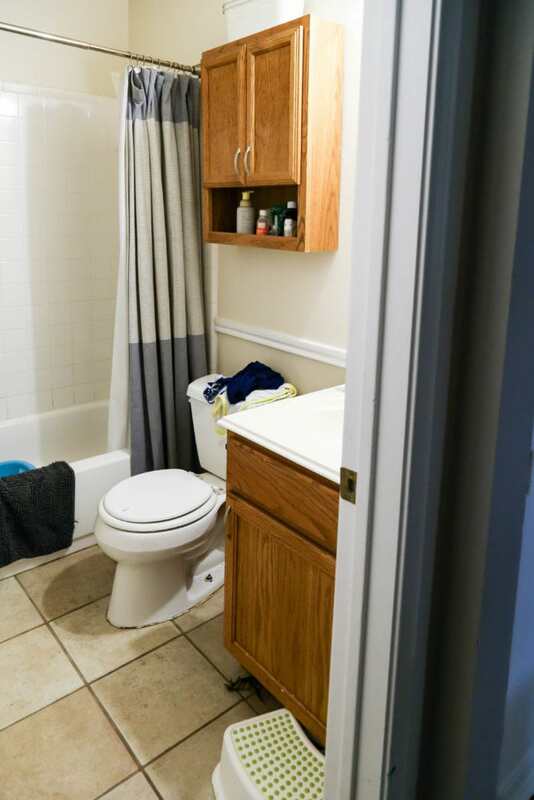 Now, this is my full time job – and this bathroom is tiny. So, I’m thinking we’ll probably be able to handle it. Aaaaanyways, you aren’t here to hear me make excuses for why I’m taking back my declarations, you’re here for the details on the new bathroom. Let’s do it. It’s time for the Jeffrey Court Renovation Challenge and we’re going to CRUSH IT! Side note: Later in the challenge there will be an opportunity for you to vote for our project. I’ll love you forever and always if you help us win! Here’s the inspiration board we’re working with. 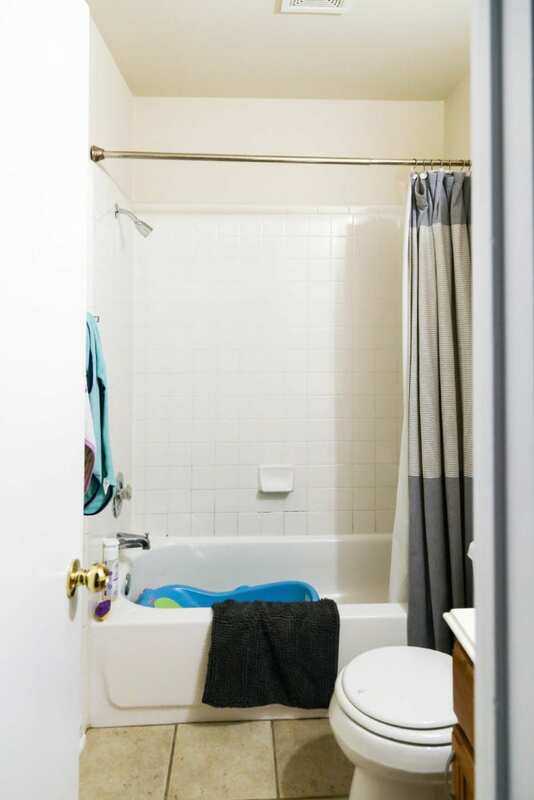 Some of these products have already been purchased or gifted to us (like the light, the faucets, and – obviously – the tile), but most of it has not. We’re kind of avoiding purchasing anything major for the room until we have the tile in place so we can see how it all looks. We went bold with the floor tile, which I’m thrilled about, but I want to see it in the space before we really commit to anything. So, what’s the timeline here? We’ve got six weeks to finish the room (full disclosure: we’ve already started and you’re getting the updates a few weeks late…but we aren’t done yet!). This is week one, and six weeks from today you’ll get the full reveal. Each week from now until then I’ll be coming here to share some updates and progress with you – and eventually, shamelessly begging for your votes. You can click here to go to the challenge landing page to see the other bloggers participating – you’ll definitely want to follow along, because they’re all going to be awesome! I’m so, so excited to be getting started on this renovation, and I hope you’ll follow along for the next six weeks! Can’t wait to see the transformation! I think the bold tiles are going to be perfect – a big pattern, but a small space. 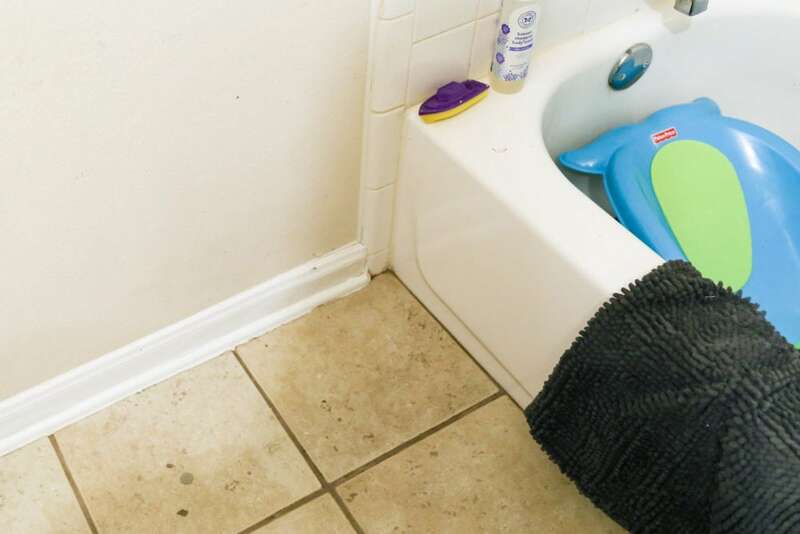 The before pictures look an awful lot like my kid’s bathroom. It’s on the to-do list!